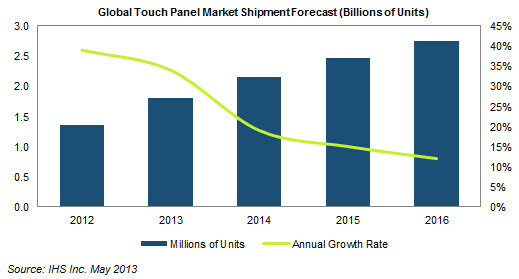 IHS forecasts a total of 2.8 billion touch-screen panels will ship in 2016, up from 1.3 billion in 2012. Shipments in 2013 to surge 34 percent to reach 1.8 billion units, as per IHS. “Growth in the touchscreen market will be driven by increasing penetration in markets beyond the smartphone and tablet businesses,” said Duke Yi, senior manager for display components and materials research at IHS. “Demand so far has largely been limited to these two markets. However, touch-screen sales are increasing dramatically across a broad range of products, particularly notebook PCs.” “The notebook represents the key near-term growth generator for touch-screen displays,” said Yi at an event. IHS finds global shipments of touch-screen-equipped notebook PCs will rise to 78 million units in 2016, up from just 4.6 million in 2012. By 2016, notebooks will account for 12.3 percent of global touch-screen shipments by area, up from less than 2 percent in 2012. Prices for touch-enabled notebooks are declining, with a popular model from Asustek Computer Inc. falling to a $700 price in China, Yi noted. This is making the touch screens more affordable for mainstream consumer notebook PC buyers. The form factor of notebooks is evolving to suit touch technology, with new alternatives to the traditional clamshell arising, including detachable, slide, foldable, flip and twist. Other analytical points shared by IHS includes: Touch leaders Projected capacitive is expanding its dominance of the market with 96 percent of touch screens expected to use the technology in 2016, up from 79 percent in 2012. Asustek of Taiwan took an early lead in the touch notebook market, taking the No. 1 rank in the first quarter. Atmel Corp. of the United States was the top touch controller integrated circuit (IC) chip supplier in in the first quarter. Among touch-screen panel suppliers in China and Taiwan, the dominant suppliers in 2012 were No. 1 TPK and No. 2 Wintek, which are far ahead of the other suppliers in terms of revenue. In Korea, Iljin Display was the top touch panel supplier.